Crime Stoppers features unsolved crimes when a detective has exhausted his leads in a case and feels that information from an anonymous source would reinvigorate his investigation. A North Monroe Business District’s community project was vandalized with graffiti last weekend within 24 hours after it was completed. 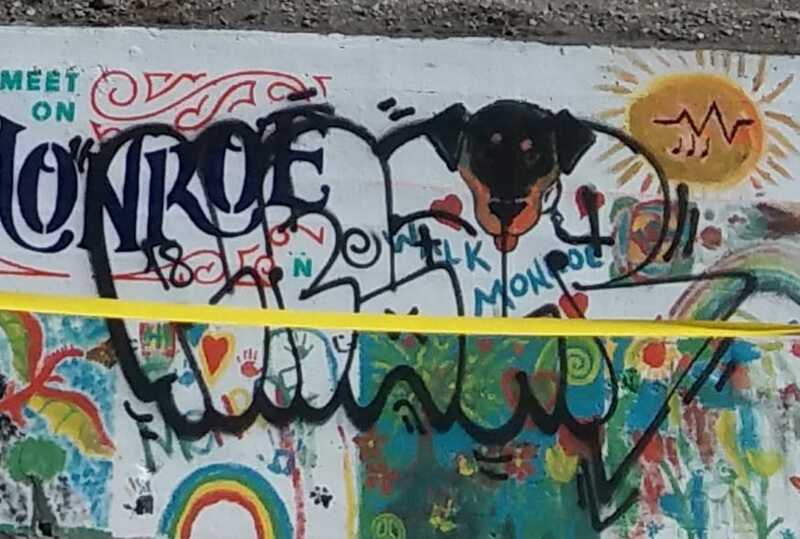 The Spokane Police Department is seeking information related to the tagging of the mural, which is located on North Monroe St. just north of W. Cora Ave. Crime Stoppers of the Inland Northwest is offering a cash reward for anyone providing information leading to an arrest in these incidents. Photos attached. Graffiti not only destroys property, but it can costs cities and residents valuable resources and clean-up costs each year. Graffiti also has a negative impact on neighborhoods and invites further vandalism and criminal activity. Spokane Police Major Crimes detectives are looking to the public for tips regarding a fatal shooting and are partnering with Crime Stoppers of the Inland Northwest to offer a reward. The incident occurred just before midnight, 11/7/2014, near the intersection of S. Elm Street and W. 10th. Anyone with information on this incident is asked to call Crime Stoppers at 1-800-222-TIPS (8477) or submit the tip via the Internet website www.crimestoppersinlandnorthwest.org. Spokane Police Major Crimes Detectives are seeking information from the public regarding the homicide that occurred just after midnight on 11/7/2014. The Spokane County Medical Examiner’s Office identified the victim as 26-year-old Zachery D. Lamb. Detectives are specifically looking for anyone who may have witnessed anything suspicious on 11/7/2014, between 11:45 pm and midnight, in the area of Elm St. from 2nd to 10th Avenue. Witnesses indicated that the suspect vehicle was a dark colored SUV with a roof rack hanging approximately 1 foot over the windshield. The suspect is described as a white male in his 40’s with a gravelly voice. Crime Stoppers is offering a cash reward of up to $1,000 to anyone providing information leading to an arrest in this incident. Persons with information should call the Crime Stoppers Tip Line at 1-800-222-TIPS, or should submit the tip via the Internet website www.crimestoppersinlandnorthwest.org. Tipsters do not have to give their name to collect the cash reward. Crime Stoppers of the Inland Northwest is a civilian organization that promotes public safety by paying cash rewards for information that solves crimes. It is not affiliated with law enforcement. Spokane Police Major Crimes detectives are investigating a fatal shooting. The incident occurred last night just before midnight near the intersection of S. Elm Street and W. 10th. A witness indicated an unknown male shot the victim multiple times before fleeing. Last night, 11/7/2014, just before midnight, Spokane Police received a report of a shooting in the 1000 block of S. Elm. The caller indicated a male acquaintance had been shot multiple times by an unknown male suspect and the suspect, described as a white male in his 40s, driving a dark colored SUV, fled the location after the shooting. SPD officers quickly arrived on scene and located the victim, who had sustained life-threatening gunshot wounds to his torso. The adult male victim was transported to the hospital and pronounced dead. Officers searched the area for the suspect, however he was not located. SPD Major Crimes Detectives responded to the scene to investigate. The investigation into this incident is on-going. 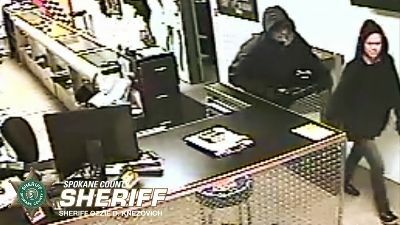 Spokane County Sheriff Office Major Crimes detectives are trying to identify a robbery suspect and they are asking for your help. 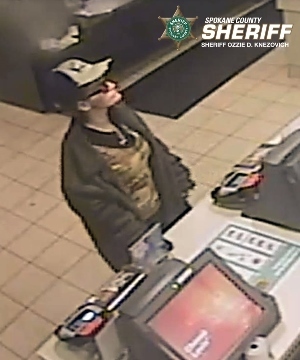 On January 18th, 2015, this female suspect walked into the McDonalds located at 2222 North Argonne Road in Spokane Valley at approximately 10:15 p.m. The suspect walked up to the counter when it was unattended and used a pair of wire cutters to cut the credit card machine and a donation box free from the counter. Employees tried to stop and detain the suspect but she fought to break free. The suspect ended up falling to the ground and dropping the stolen items before running away. A perimeter was established but a search with a K9 was unsuccessful. The suspect is described as a white female in her 30’s, 5’10”, thin build with darker blond hair. Crime Stoppers of the Inland Northwest is offering a cash reward for anyone providing information leading to an arrest in this incident. Persons with information should call the Crime Stoppers Tip Line at 1-800-222-TIPS, or should submit the tip via the Internet website http://www.crimestoppersinlandnorthwest.org. Tipsters do not have to give their name to collect the cash reward. Crime Stoppers of the Inland Northwest is a civilian organization that promotes public safety by paying cash rewards for information that solves crimes. It is not affiliated with law enforcement. 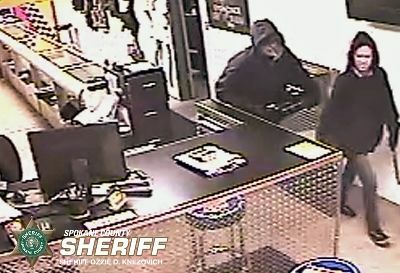 Spokane Valley Sheriff’s Investigative Unit (SVIU) Detectives are investigating an increase of “Smash and Grab” type burglaries of businesses in Spokane Valley during the last month. Surveillance video shows the suspects appear to be a male and female team who enter businesses by breaking the front door glass, steal cash drawers and other items that are generally easy to carry before quickly exiting the business. Surveillance video taken during one of the burglaries shows the suspects entering with crowbars in hand as they quickly worked together to victimize the business. Detectives are hoping citizens can identify the suspects from the video and pictures. Crime Stoppers of the Inland Northwest is offering a cash reward for anyone providing information leading to an arrest in this incident. Persons with information should call the Crime Stoppers Tip Line at 1-800-222-TIPS, or should submit the tip via the Internet website www.crimestoppersinlandnorthwest.org. Spokane Valley Traffic Unit Investigators are asking the public for information regarding a serious hit and run collision that occurred on Friday, November 14th, 2014 in Spokane Valley. Spokane County Valley Sheriff’s Deputies responded to a vehicle vs. pedestrian hit and run collision at the intersection of 16th Street and Oberlin on November 14th 2014, at approximately 5:20 p.m. A citizen found the 51-year-old male victim crawling off of the roadway and immediately called 911. The citizen told investigators a dark colored vehicle passed him at a high rate of speed as he traveled east on 16th, approximately 3 blocks prior to the hit and run scene. The vehicle continued to drive recklessly after passing the citizen and reportedly almost caused several other collisions. The citizen tried to obtain the vehicle’s license plate but was unsuccessful. When he observed the victim in the roadway, he stopped to help, but stated he did not actually see the collision. The victim sustained a head injury and a severe leg injury. He was transported to a local hospital for treatment and is in stable condition. On July 12th, 2014, Spokane Valley Sheriff’s Deputy Chan Erdman responded to the old Chung Hua Garden, located at 18203 E. Sprague, on a commercial burglary call. The new owner of the building said the last time he was there was approximately two weeks prior and the building was in the shape he had purchased it. Since that time, it was obvious someone had been not only living inside the building, buy they had also stole nearly all the copper plumbing, wiring and all the stainless steel appliances. The new owner estimated the damage and loss to the building near $100,000. There are no suspects at this time. Crime Stoppers is offering a cash reward for anyone providing information leading to an arrest in this incident. Persons with information should call the Crime Stoppers Tip Line at 1-800-222-TIPS, or should forward the tip via the Internet website www.crimestoppersinlandnorthwest.org. Tipsters do not have to give their name to collect the cash reward. Crime Stoppers of the Inland Northwest is a civilian organization that promotes public safety by paying cash rewards for information that solves crimes. It is not affiliated with law enforcement. On July 15th, 2014, at noon, Spokane County Sheriff’s Deputy Chad Ruff responded to the 5600 block of South Hogan on a residential burglary call. The complainant said he and his wife went to bed at about 11:00 p.m. the night prior. When they woke up at 8:00 a.m., they found both the front and back doors open. The homeowner said he was certain both were closed when they went to bed and that the front door was locked. After checking the house, they realized the homeowner’s wallet was missing and his wife’s watch had been stolen. They contacted the bank and learned someone had attempted to use their credit card at about 7:30 a.m. The institution will provide video surveillance of the suspect(s), however at this time there is no suspect information. Yesterday, July 9th, 2014, at about 5:00 p.m., Spokane County Sheriff’s Deputy Dave Bratton responded to the area of 200 E. Cliff to an occupied residential burglary. The 13-year-old complainant called 911 and said she and her sister were hiding in their basement crawl space because they heard someone break in through the front door. Deputy Bratton contacted the 13-year-old female and her 9-year-old sister. They said they heard knocking on the door and looked outside. They saw a small shiny gray car in the driveway and saw two males in the vehicle. The 13-year-old described the driver as a white male, wearing a blue t-shirt, bald with a medium build. She said the passenger was also a white male, 20-30 years old wearing a black t-shirt and appeared skinny. The 13-year-old said the passenger walked up to the door, knocked and looked through the window. She said he walked back to the car and talked to the driver. She said both suspects walked towards the front door and she and her sister ran downstairs and hid in the crawl space like their parents had taught them to do. The girls said they heard the front door break and heard the suspects walk upstairs. Deputy Bratton saw that the front door frame of the residence had been forced open. Several other deputies, as well as Air-1, had arrived in the area and were not able to locate the suspect vehicle. Deputies checked the residence and confirmed the suspects had left. The girl’s mother arrived at the residence and did not notice anything missing. At this time there is no further suspect information. On January 10th, 2014, at about 4:00 p.m., Spokane County Sheriff’s Deputies responded to the 10500 block of East Empire on a report of a deceased female caught on a tree in the river. Deputies confirmed there was a deceased female in the river and the Spokane County Sheriff’s Office Marine Unit recovered the body. 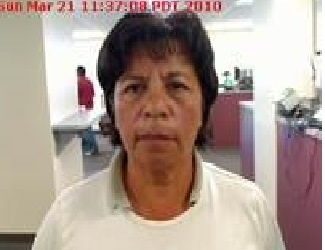 After a lengthy investigation by the Spokane County Medical Examiner’s Office and Sheriff’s Office detectives, the victim was identified as 58-year-old Maria Guadalupe Vega. Vega was believed to live at an address in Tijuana Mexico. Vega crossed into the United States at San Ysidro on September 24th, 2013, at 12:51 p.m. She advised she was en route to 3600 South Las Vegas Blvd, the Bellagio Hotel and Casino, but never made it. No known vehicles or associates are known at this time Vega may have been with. The Mexican Consulate has been advised of this investigation and is attempting to locate next of kin. Detectives are asking for any information citizens may have that either possibly knew Vega or saw here prior to January 10th. Any information is asked to be directed to Detective Justin Elliott at 509-477-3786. See photograph of Vega. On June 9th, 2014, at 12:45 p.m., Spokane Valley Sheriff’s Deputy Jay Bailey responded to an occupied residential burglary call near the 11500 block of East Mission Road. Deputy Bailey contacted the 19-year-old victim who said she was studying when she heard someone pounding on the front door. She said she could only see the male suspect’s baseball hat so she moved to the bathroom and could only see his shoulder. When the suspect continued pounding louder on the door, the victim ran outside with her dogs and called 911. A neighbor to the west of the victim’s residence heard the loud pounding and met the victim in her back yard. The neighbor ran around the front of the victim’s house and saw the front door had been kicked in. He entered the residence and confronted the male suspect coming out of the master bedroom. The neighbor said the suspect was stuffing items inside his backpack and told him “someone” was looking for him. The suspect was described as a white male, mid 40’s, 5’10”, 155-165 lbs, reddish mustache and beard, black baseball cap, black t-shirt with a ? logo on the front, and wearing brown shorts. The suspect walked out the front door and the neighbor tried to grab on to his shirt. The suspect continued east on Mission Road. The suspect fled north on Wilbur, then east on Nora towards a cul-de-sac and jumped a fence. The suspect was never located. The neighbor collected a coin counter the suspect dropped when he jumped the fence. The victim’s parents arrived at the residence and confirmed multiple collector coins were stolen. These included approximately 200 “Ike” silver dollars, 1,000 “Benjamin Franklin” silver fifty cent coins (1940-1950’s) and 40 silver quarters (1940-1970’s).